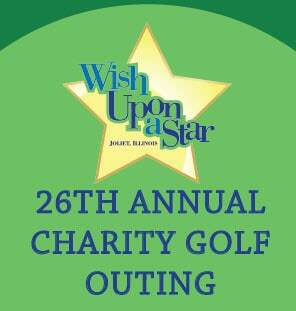 Wish Upon A Star is proud to announce the 26th Annual Wish Cup, with all proceeds going to benefit Wish Upon A Star of Joliet, IL. This year’s golf outing will be held on June 30th, 2018 at Inwood Golf Course at 3200 W. Jefferson Street in Joliet. With a shotgun start at 9am (registration starts at 7am), 2 drink tickets, a hot dog at the turn and a steak dinner afterwards, it’s sure to be a great time! The outing will also feature raffles and prizes for Hole in One, Closest To The Pin and Longest Drive. Entry is $520 per foursome, $130 for an individual or if you don’t like to golf, you can always join us for just $35 at the steak dinner afterwards. All registrations must be received by June 15th. Registrations can be picked up at Kosack’s Black Tie Formalwear at 1948 Essington Rd in Joliet or you can register and pay online by visiting wishgolfouting.com. Wish Upon A Star is a 501c3 charitable organization in the State of Illinois dedicated to fulfilling the dreams and wishes of children with severe and life threatening illnesses. If you have a child in need or know of a child in need, please contact us for more details on how we can make their dreams come true!